Did you come back yesterday? How much cheese did you buy? What's the matter with Daming? What time does your school start? 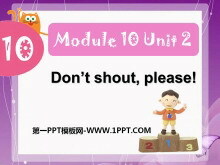 《Don't shoutplease》PPT课件2 Do you like playing football/ skipping/ walking? Yes I do. /No I dont. Dont play football___________. Dont skip___________. Dont walk___________. 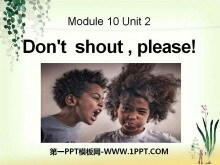 Three tasks(任务）: 争做 small civ..
《Don't shoutplease》PPT课件 New Words shout 呼喊 baby 婴儿 grass 草地 dangerous 危险的 Guessing Game Dont take pictures! Dont smoke! No smoking! Dont play football! Dont park your car! 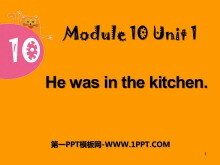 ... ... ... Read and obs..
《He was in the kitchen》PPT课件 New Words kitchen厨房 toilet卫生间 room房间 living room 客厅 sofa 沙发 My family my parents grandpa and grandma my brother and me 关键词：《He was in the kitchen》教学课件，外研..
《I feel happy》PPT课件2 Chant Are you feeling sad? No! No! No! Are you feeling bored? No! No! No! Are you feeling angry? No! No! No! 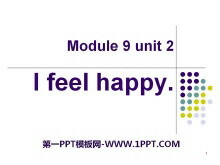 Are you feeling happy? Yes! Yes! Yes! tired 疲倦的，劳累的 grandfather 祖父..
《I feel happy》PPT课件 Look and say Does she feel happy? Noshe doesnt. How does she feel ? She feels bored. How does he feel ? He feels hungry . How does he feel ? He feels thirsty . ... ... ... 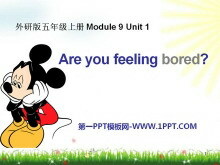 Listen and Rea..
《Are you feeling bored?》PPT课件2 Whats the matter? (1) Are you feeling sad? (2) Do you miss China? 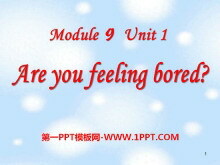 (3) Are you feeling bored? (4) Do you want to play chess? (5) Are you feeling angry? ... ... ... Let's make a..
《Are you feeling bored?》PPT课件 Lets chant! happy happy 哈哈哈 bored bored 真无聊 angry angry 哼哼哼 sad sad 呜呜呜 Let's check! You can say as fast as you can! (以你最快的速度说！) ... ... ... Is he/she feel..
《Yesterday I went to Sam and Amy's school》PPT课件2 Review the words do exercise 做运动 in the playground 在操场 skipping rope 跳绳 before 在之前 coffee 咖啡 tea 茶 Read loudly 大声读出 What time does school s..
《Yesterday I went to Sam and Amy's school》PPT课件 Warming up What's the time? What time is it ? 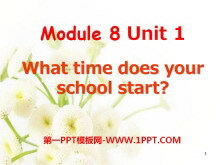 Its twelve oclock Its half past six Its eleven oclock Its half past one ... ... ... UK s school life Before nine..
《What time does your school start?》PPT课件2 before 在之前 before before before before nine oclock playground playground playground in the playground coffee coffee coffee coffee I like coffee. 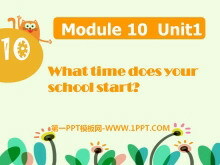 ... ... ... What..
《What time does your school start?》PPT课件 Chant: Get up get up I get up at 7:00. Go to school go to school I go to school at 7:30. Watch TV watch TV I watch TV at 5 oclock. 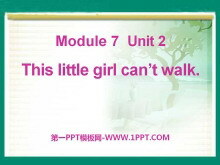 Go to bed go to bed I go to bed ..
《This little girl can't walk》PPT课件2 Warming up. The dog helped the girl. The dog helped the firefighter. The dog helped Sam. Now we help the dog . Look and say. Usecant andheip The little boy cant walk . Hi..